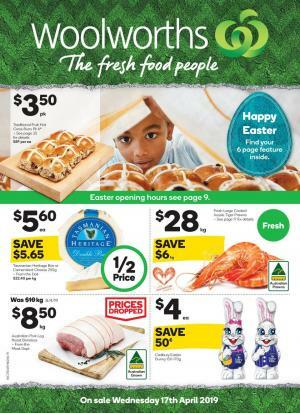 Browse Woolworths Catalogue 17 – 23 Apr 2019 their specials and current price drops. You will love Woolies online deals. And even more… Also, Woolworths Catalogues make deals on special days. Christmas, Easter, Seasonal food sale, Mother’s Day, Valentine’s day etc. are among these. If you are in search of a good browsing system for Woolworths Catalogues where you can also share your opinions you may use this page. From top chocolate brands like Cadbury, Lindt, you can find exclusive gift boxes for Christmas. Woolies is well known for its Christmas online or in-store sales. The sales are the promoted items of most Christmas Catalogues, too. This store offers rewards for a certain amount of purchases on some products. Generally, catalogues announce what these are. Since these specials are published weekly, it’s necessary for customers to get them and learn what is going on. Follow our Facebook page to follow the Woolworths Catalogue and more sales from other retailers. If you want to see products in simple lists, read our reviews. They provide a simpler view of this wide product range. For more catalogues please check out other categories, too. You can enjoy the latest Woolworths Catalogue 15 July - 21 July 2015 products from now on. On Wednesday a large product range of Woolworths consisting school supplies which are about to become very highly favorite because of the new semestre. Woolworths Catalogue offers a large product range. Use our simple browser for the newest products of the Woolworths and Coles on the main page. Check out some of Woolworths Catalogue 15 July 2015 on below. Of course the first thing getting my attention is those products of half price deals on pg 4&5. Essentials like packed breads, tea, olive oil are featured on that section. Amazing deal is waiting for you ! Cookware products by Arcosteel 30% off are featured on pg 7. Check out that page for more information. Woolworths Red Spot Specials is the top deal of the whole week. You will get a nice product range from these red sport specials. Maybelline cosmetics, personal care items, Swisse pills for women and men pg 8&9. Woolworths earn&learn products and bonus sticker after every purchase of those products on pg 10. Our favourite soda variety of Schweppes, Solo, Sunkist, Powerade, Sprite and Fanta pg 12&13. Snacks, Doritos chips and popular confectionery products from various brands pg 14&15. 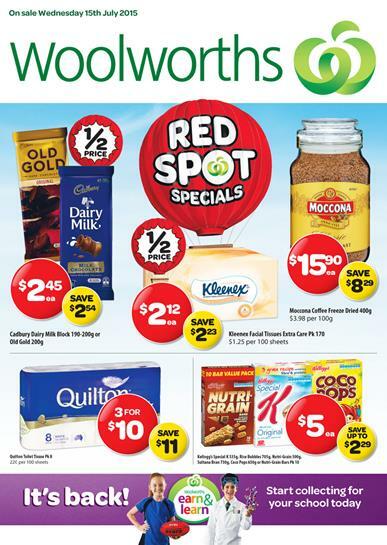 Woolworths Catalogue Specials Weekend 10 July 2015 - 12 July 2015 prices are viewable on the preview page. Save more with getting top qualtiy food, fruits, fresh grocery, bakery and more. Weekend sale catalogues of Woolworths have always been on the top of the list of people. Woolworths specials are available from now on. You can browse it here and shop on the official page. Find new Coca Cola price pg 2 and Red Spot Specials which are also available on the woolworthsonline official page. Coca-Cola, Zero Diet coke etc. 30x375mL $16.80 pg 2. Last 4 days remaining for these products can be viewed on the Woolworths Catalogue preview page. Amazing products and Woolworths products are available. You might find products with prices valid until Thursday. You can find freshest and newest products at Woolworths catalogues. Online offers are also stocked in-store. Check out more of the supermarket grocery products on the main page. Coles, ALDI, IGA and Woolworths are leading brands of the supermarket products. Woolworths Catalogue is letting us experience a great joy of shopping in this week again. Their meat, grocery, high quality household items, are really looking appealing. With the amount of money you can save with Woolworths specials I believe every visitors will leave the stores very happy in the second week of July 2015 ! If you want to join the joyful experience of Woolworths Catalogue online specials 8 July - 14 July 2015 please go the preview page of the catalogue. Visit the pages for browsing the whole catalogue range. 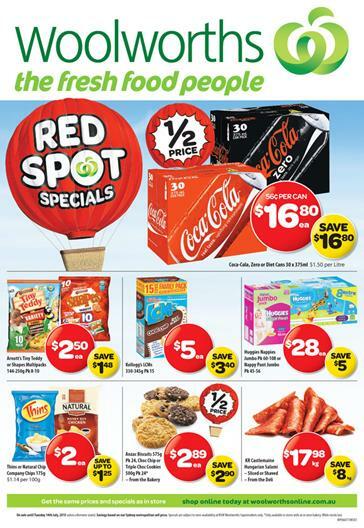 Woolworths Catalogue online specials 8 July - 14 July are mainly red spot specials on the first section. With red spot specials you are experiencing a random choice of products with best prices of the week. Packed food products like Borg's frozen puff pastry and cheese&parsley premium fish fillets pg 2. Choc Chip or triple choc and Monster energy drink pg 3. Some personal care items such as Pantene shampoo or conditioner and some household items on pg 4. Underwear of Bonds for men and Bonds socks for men as well pg 5. A lot of popular beverage such as coke, Solo soft drinks, Pepsi packs and a lot more of this kind are available within this deal. Check out latest Woolworths cheap cheap specials for this weekend ! 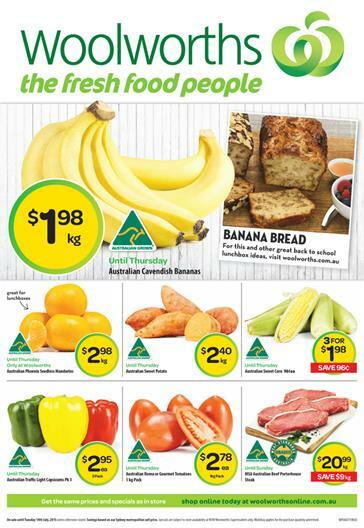 Single page fresh food sale with fresh prices are valid until 5 July 2015. You can browse the latest Woolworths Catalogue specials as well as this product range. You can read the recipes of the Woolworths prepared by the experts of delightful meals. Enjoy the best prices of fresh grocery and meat. Every kind of food product is at their best form at Woolworths Catalogues online. Australian farm products, different European and American tastes are the most popular items while they also combine the traditional sweets from all around the world. Among the packed meals and food range of Woolworths Catalogue you can find Chinese food, pizza, Indian food, Mexican food and even more ! Visit woolworths.com.au for the recipe of blueberry cheesecake and learn new price for blueberries on this Woolworths specials weekend range. Protect your body against viruses in winter with Vitamin C contained by the Mandarines. This weekend price of Woolworths is below. Stay healthy with less carbohydrate and lipids which are not business of broccolini. Make a broccolini soup and buy them from Woolworths Stores. Remember that these prices are valid until Thursday which means you got 4 more days to go ! Meanwhile you can visit catalogue for more fresh food and prices ! Go to the new preview of Woolworths Catalogue Red Hot Specials 01 July - 07 July 2015. See new half prices on Woolworths Catalogue that are selected from top quality products. List of the Woolworths Catalogue Red Hot Specials 01 July might be found on this post. Woolworths Catalogue offers new snacks, chocolates and some beverage on pg; 2-3. From 01 July, WED you can shop for these products appearing on the pages of the Woolworths Catalogue. You can also see the new half prices. Schweppes lemonade packs, and Pepsi Max pack on pg; 2. Some snacks, chocolates with half prices of the Red Hot specials of Woolworths on pg; 2-3. Bakery products like Crusty Ciabatta loaf 450g $2 Cobb Bread 520 g, $2 pg; 4. Woolworths Win 1 of 10 ultimate sports holidays sale is available on the first section of the catalogue. Oreo biscuits, Coke, Scwheppes are alternative options for the party. Cereals and nutritious products are top products when it we discuss about breakfast products at Woolworths and Coles. Deli products are also available in further pages.